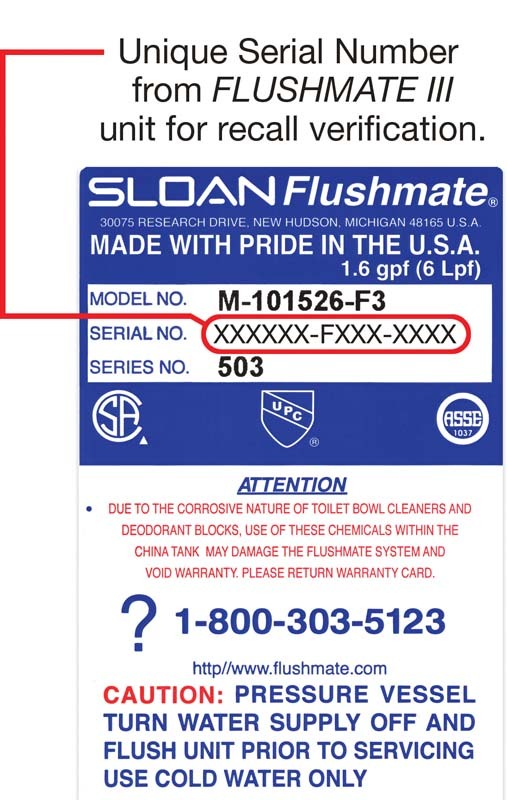 The recall previously announced for the Series 503 Flushmate III Pressure Assist Flushing System has been expanded, affecting approximately an additional 351,000 systems. This post discusses this recall and talks about how the jury is still out on whether a product is effective and safe even if is has been on the market for many years as these products were. Systems manufactured from October 1997 through February 2008 and now March 2008 through June 2009 are being recalled as the system can burst, at or near the vessel weld seam, releasing stored pressure. It is possible for this pressure to lift the tank lid and shatter the tank, posing a laceration hazard in addition to potential property damage. The recalled units are rectangular, black, and consist of two-piece vessels made of injection molded plastic. The units have a 16 character date code/serial number located on the label on the top of the system. The first six numbers shown is the date code, in a MMDDYY format. Recalled units range from 030108 through 063009 (March 1, 2008 through June 30, 2009). The prior recall affects 101497 through 022908 (October 14, 1997 through February 29, 2008). While there are no reports of injury, Flushmate has received three reports of the units bursting and causing property damage. 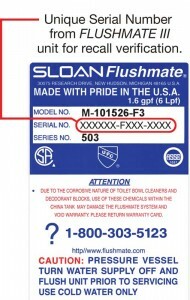 Consumers are being instructed to contact Flushmate online or contact them at 800.303.5123. What Is Crazy About This? I’m really not all that interested in toilet recalls. No one is going to get badly hurt. The bigger fear that precipitated this recall I’m sure is the risk of property damage. What I find pretty stunning and telling about this is that we are talking about systems that are 17 years old being recalled. What I think is interesting about this is that there is a certain inertia to keep products on the market that have been on the market forever because they are perceived to be safe because they have to be safe after all of this time. But, sometimes, it just takes a long period of time to really connect the dots of the product to some defect. SSRIs were on the market for years and years before anyone realized that they were causing suicides. Plaintiffs lawyers who were screaming otherwise were dismissed as fools. These fools eventually earned millions of dollars for themselves and their clients. The take home message is that you can never stop analyzing a product to be sure that it is really safe and effective.